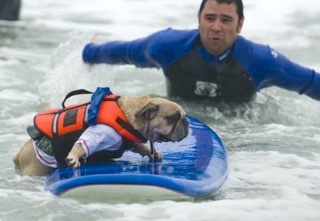 Surfers come in all shapes and sizes….and these days, species. 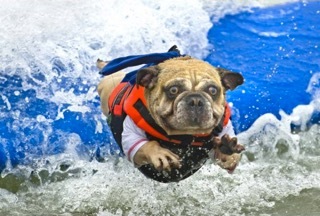 Meet Deagen, the ultimate surfing dog – his moves and expressive eyes made him an instant celebrity in the surfing world. We talked with his owner Stephanie about how she got him into surfing and what’s next for Deagen. How did you get Deagen to surf? 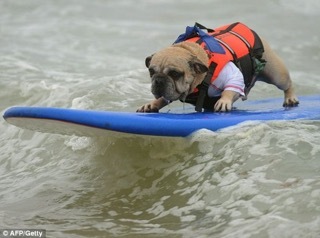 We heard about a charity event called SurfCity SurfDog. It was the first time this event was being held and it was located in Huntington Beach. Knowing how much Deagen loves the dog beach there, we figured we would enter and take him down to the beach for one of the lessons they were giving a few weeks before the competition. We figured we’ll take him out and see if he likes it, if he does, Great! If not then he won’t participate. No big deal really, after all the money was going to charity. We took Deagen down to the lesson, put him on a board and he rode his first wave in. He loved it so much he wanted to go back out. The second his board hit the sand he jumped off, turned around and looked for his dad (who was in the ocean) to take him back out. He was a natural and he loved it. What was his reaction to catching his first wave? Deagen loved catching his first wave, I am not really sure he understood what just happened, but when he rode that first wave in, he jumped off the board turned around looked for his dad (who was in the ocean) to take him back out. We ended up staying at the beach for a few hours just surfing away. He absolutely loved it. What’s the best part about getting him on a board? they are really missing out. How is Deagen handling all this fame? Deagen would like you to believe that it does not effect him at all and he hasn’t let his fame change him or spoil him, but we would have to disagree. He knows very well that he is a little celebrity and he lets it be known every day. He requests that he be picked up and put onto the couch, even though he can jump up on it himself. We know this because we have seen him do it. At night when his sisters are told its time for night-night, they jump off the couch and run to the back door to go potty first. Where is Deagen you ask? Still laying on the couch waiting for you to come pick him up and carry him outside. He knows when we are at events for him, he knows how to act when cameras are around, and he knows how to act when he is greeting his fans. Deagen has recently retired from surfing in competitions. He still surfs for fun and we still go to the events to see our friends and hang out but he was just done with surfing competitively. He has done some modeling in his retirement and filmed for tv shows and documentaries. Now Deagen spends his days laying in the sunshine, swimming in his pool and going to the dog beach to run up and down, and swim in the waves. Deagen, you rock. Keep soul surfing and sharing your stoke. Thanks so much for taking the time to woof it up with us!